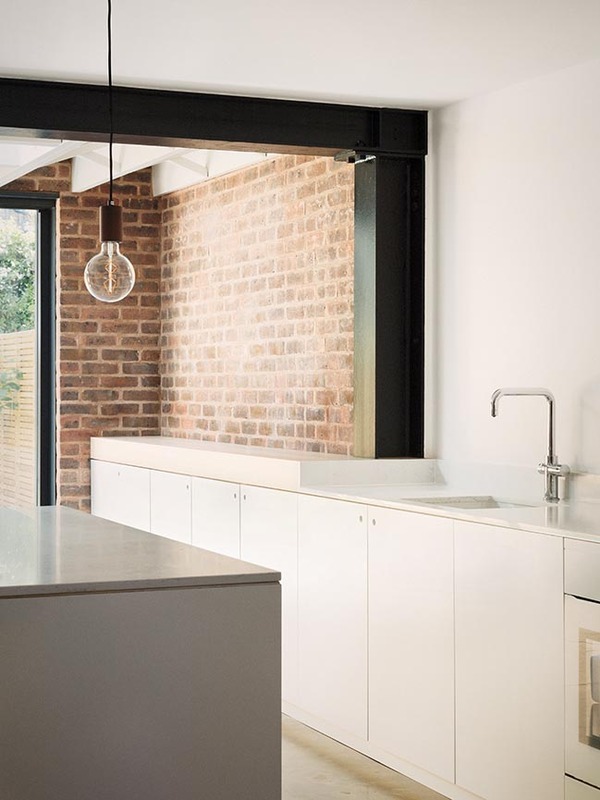 A 1970s brick terrace house in Northwest London has been renovated and reworked into a contemporary family home by DF_DC. 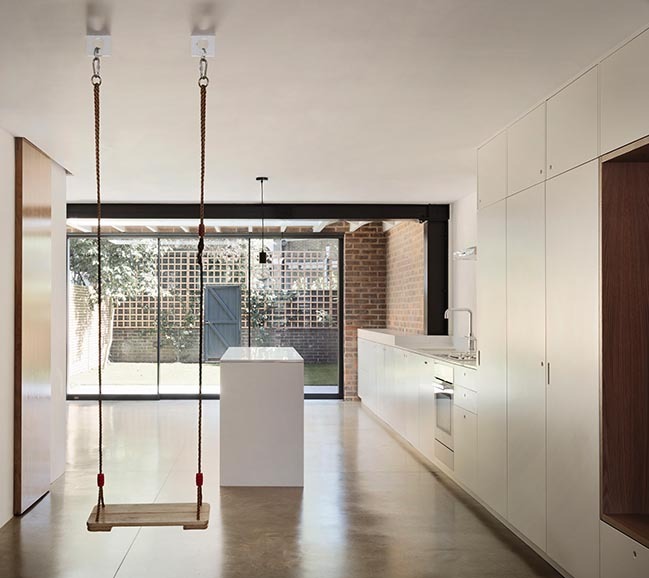 Adding 14sqm of living space with a rear extension, Elliott Square is completed with rigorous, yet simple interiors and features a swing set for adults and kids alike. 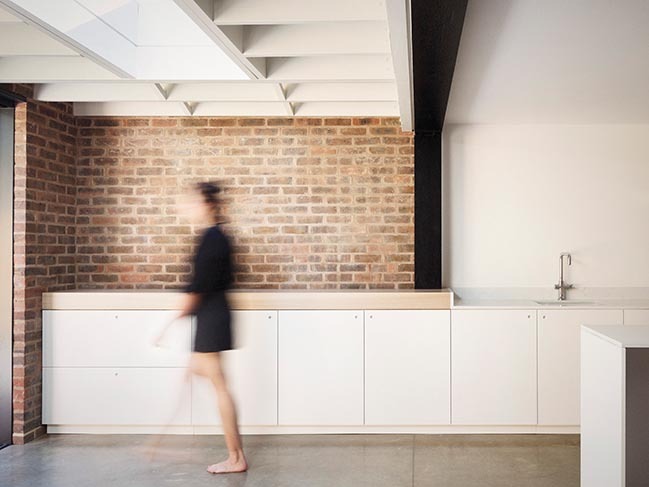 From the architect: Finding the original plan of the house constraining the client, a Brazilian couple with young children, wanted a design that prioritised flexibility. DF_DC responded to this by knocking through the garage and small rooms on the ground floor into one single, continuous space linking front to back and extending into the garden. This removal of conventional room structure allows for utility elements to be lined up against just one wall. Creating ample kitchen and storage facilities while freeing up the vast amount of the floor for the family’s use. 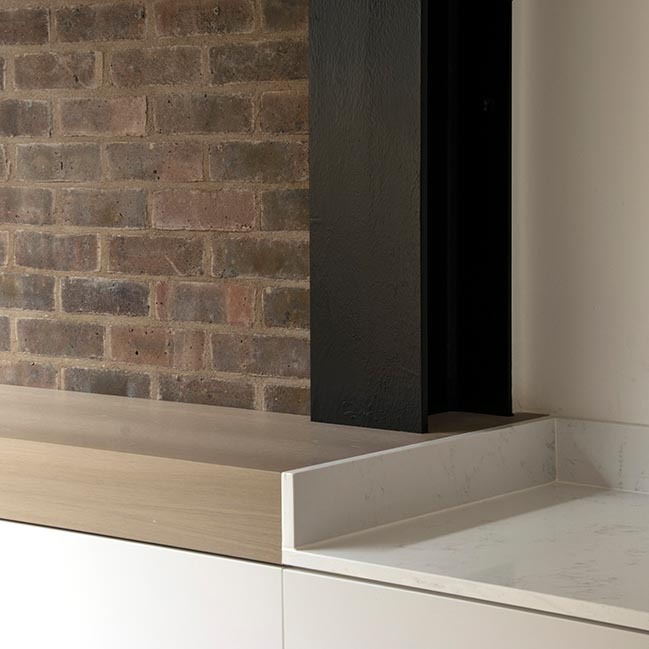 The materials used in the interior and fittings were kept to complementary soft palette of steel beams, exposed brickwork, European oak and buff polished concrete. 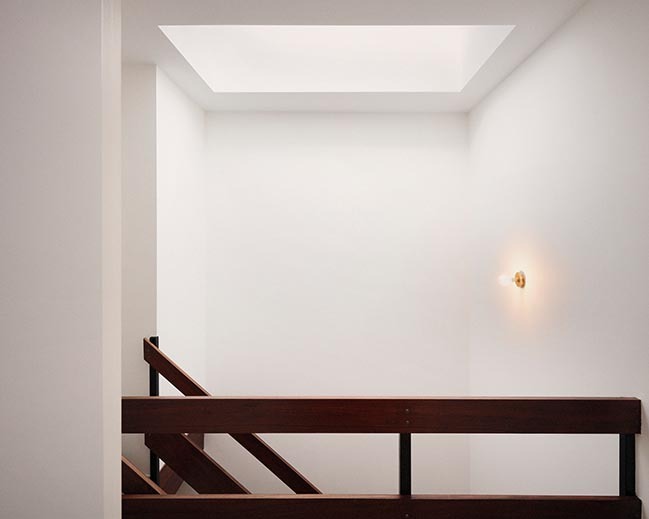 Generous light is brought into the house with a retractable glass door to the garden, a basement screen window to the front and two wide skylights, one above the framed staircase and one in the rear extension. 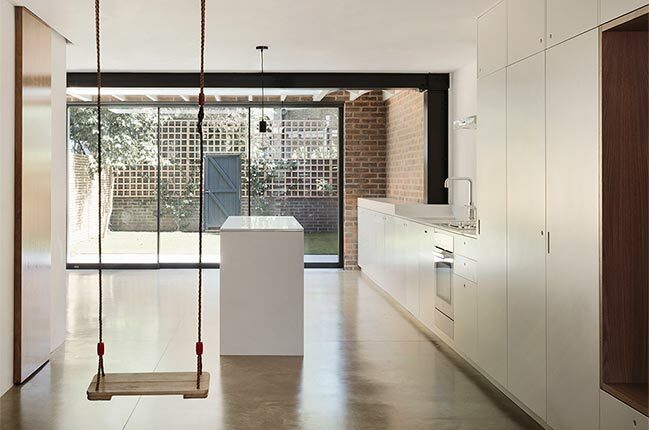 At night the home is lit by surfacemounted or pendant lighting depending on the type of room. The upper floors both needed separate and considered approach: the first floor was divided to create a room for guests or study; the top floor with the bedrooms went through some minor reform to simplify the plan. 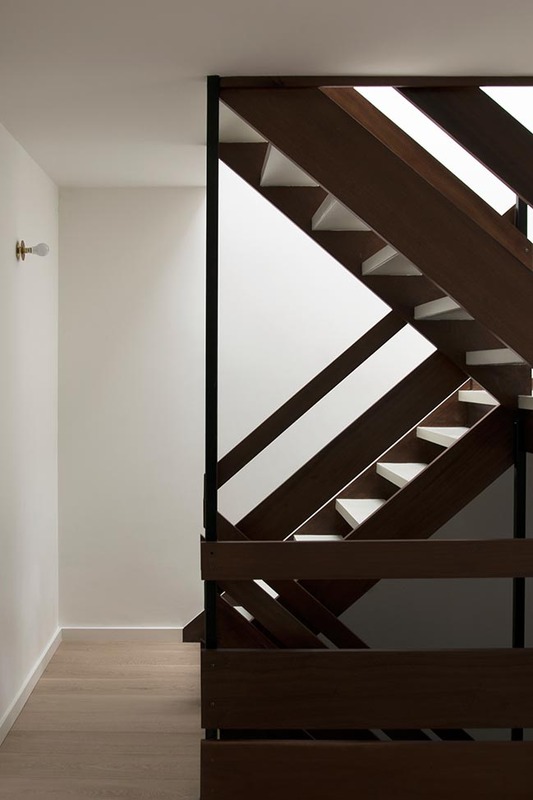 These spaces are united by the original modernist staircase, which was refurbished and adapted. 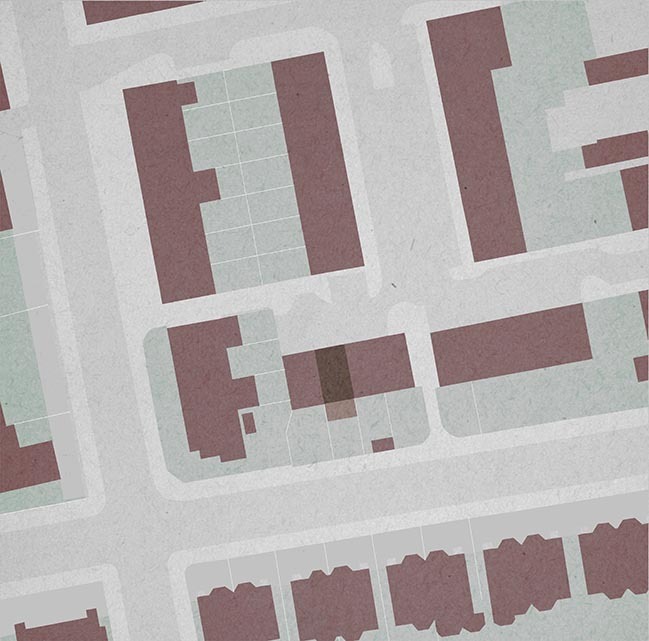 The layouts considered a new roof extension that might be implemented two years after completion. Elliott Square is arranged on an inverted “front” situation, where the main access is from a central private court and the “rear” gardens face the leafy main road a short walk from Primrose Hill. 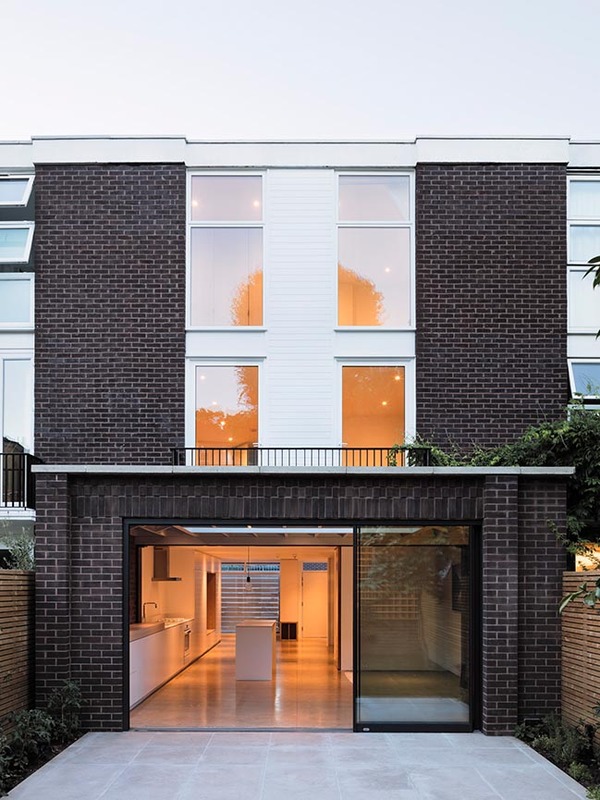 As such the design for the the new extension, reflects the heritage of the original terrace with a dark clinker brick to closely match the upper floors and neighbouring homes.